Window Cleaning FAQs Eg. How much does it cost? How should I prepare for the window cleaners coming to my place? What's included in a standard "maintenance window clean"? How can you reach the outsides of my high windows? Do the window cleaners have all the necessary insurance cover? Do you clean fly screens? Why do you ask for fly screens to be removed on Strata buildings? What if I'm not happy with the job? How do you window clean? Is a Robot Window Cleaner worth buying? Is it 'Window Washer' or 'El Toro Window & Gutter Cleaning'? Most residential clients require their windows cleaned every 3 - 6 months. However, this can vary depending on many factors, such as traffic pollution, if the house is near the beach and is affected by salt spray, or if there are a lot of little children or pets putting dirty hands or paws on the glass, etc. The cost for window cleaning small places generally starts from $150. However, it depends on the quantity and difficulty of access to the windows. Since every job is unique, our window cleaners are prepared to visit the job in person free of charge to give you a competitive quote - free of charge. If the job is relatively straight forward, once you've filled in the 'Get a Quote' form, we can often give you the price straight away. Emailing photos will help too. For more complicated jobs, we are happy to pay a visit in person to provide you the window cleaning quote. You can pay the window cleaner when he comes to do the job either by Cash, Bank Transfer or Credit Card (Visa or MasterCard, only for domestic jobs). We don't charge commission to use credit cards. Our standard payment terms are 1 day from the invoice date, but this can be adjusted on mutual agreement. Of course! All our window cleaners are willing and happy to provide you with a tax invoice. We clean Residential, Commercial, Strata, Industrial, Schools/Colleges and Government building windows - inside and out. We can access just about any windows from ground floor up to 6 storeys high. We are also licensed to use cherry pickers over 11m. We can often carry out the job within the same week of your enquiry. If you're in a rush, please let us know and we might be able to speed things up for you. To help with that, please include in your enquiry the exact address with a good description of the job and if possible, a few photos. Once you've made a booking and know the date and time for the window cleaners to arrive, we'll send you a reminder email a couple of days beforehand. if we are cleaning the inside of your windows, please make sure your blinds are pulled up, curtains are opened and any personal effects or ornaments are removed from your window sills to allow us clear access. Obviously, we clean the glass - streak free. We also wipe the window frames, sills, clean any fly screens (or fly wires) and remove spider webs from around the window area. We will remove a small amount of paint spots, bug marks and other hard marks. Below are descriptions of what is not included in our standard 'maintenance window cleaning' quotes. We want to be transparent so you completely understand what to expect with our service. Hard water stains, soap scum, lime scale, glass cancer, glass corrosion. These terms all mean similar things - that the glass doesn't appear clean, even after a normal window clean. This can occur to glass when a high concentration of dissolved minerals runs over the glass. It's most common on windows that get wet from sprinklers, swimming pools or driving rain that transfers water from fly screens to the glass. The window feels rough to touch, is dull, not very shiny and over time, gradually looses it's transparency, becoming cloudy. Special (acid-based) hard-water-stain removers are available to remove the mineral deposits and restore the glass's shine, but do not have a 100% success rate. Glass with a lot of hardened marks, stickers or after renovation grime needs special attention. It can be quite time consuming to do a thorough, careful job. You need the right tools, experience and temperament. Please make sure to mention in advance if there is anything like this for your job. 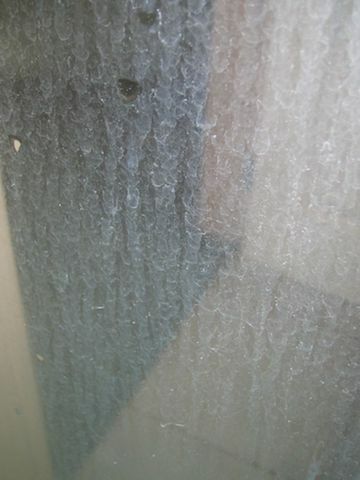 Cleaning heavy mould on window frames is not part of a standard 'maintenance window clean'. Generally, we don't come across this kind of mould (pictured) very often. It is normally the result of condensation due to poor ventilation and temprature regulation. As it takes more time and effort to remove this, we ask for it to be mentioned to us before we send the final quote, so it can be factored in. Side jams and head jams of sash windows do not normally get dirty. We do not clean this part of the window frame unless specifically requested beforehand. The inside facing cross bar or bottom rail of sash windows is normally not included in a maintenance window clean. This is beause in many cases, the top part of the window is rarely moved, and often becomes jammed. To be able to clean the cross bar, the top and the bottom panes of the sash window must be able to slide freely. Window tracks, or window runners are not included in our maintenance window cleaning price. 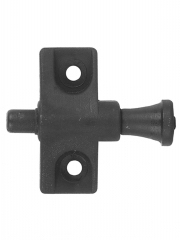 This is the part at the bottom of a window frame where the window slides left or right. We find that many clients don't want or don't need this part of the frame cleaned, so we don't want to charge everyone for it. Please ask us for a seperate quote to clean the window tracks if you would like that done. Firstly, some windows can be accessed from inside. We also use poles and tall ladders where possible. For windows above up to 6 stories that can't be accessed from inside, we have a long water-fed pole with pure water system which delivers sparkling results to glass the window frames. This amazing technology can reach up to 70 feet, or 20 meters high! It's safe to use - no chemicals and the worker stands safely on the ground. See more about cleaning high windows here. We also do pressure cleaning/house washing, gutter cleaning and can use cherry pickers or scissor lifts to access high areas. We do not do high-rise window cleaning or abseiling. Do you clean after construction work? Sometimes. This depends on several factors. However, we do understand that great care needs to be taken to avoid scratching the glass. This specialised type of window cleaning work is best left to the professionals! If these are present on the glass when it rains, the residue in the rain attaches itself to the dirt and often makes the windows look worse. So if the windows have recently been cleaned, then the rain will simply run off the clean glass and the windows continue to remain clean. Yes we do. However, if we are only cleaning one side of the windows, we will only clean the fly screens fitted on that side. Eg, we wouldn't clean internal fly screens if we're only cleaning the outside of the windows. Keeping fly screens (also called fly wire or insect screens) clean helps to keep the windows clean too. Please mention if you have fly screens at your place. Most strata buildings are designed with fly screens that need to be detached from the inside. This is because ladders cannot safely each over about 2 stories high, so there's no other way to take off the high fly screens. We acknowledge that some people may not know how, or be able to remove their fly screens as requested. If this is a concern, please let us know - it may be possible to arrange for us to come through the apartment to assist. Probably the most common kind of fly screen clip - this one is attached on the inside. We aim to go above and beyond your expectations on every job we do. 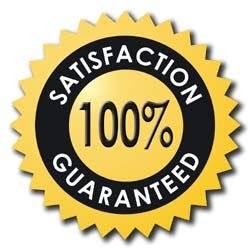 If you are not 100% satisfied, please bring it to the attention of the worker while he is there, and he'll be happy to do whatever it takes (within reason) to remedy the job. Please note, once 7 days after completion of the job has passed, weather, spider webs and other things could start to affect the quality of our work. We get job satisfaction from getting sparkling results and our goal is to keep our clients coming back to us. I'm often asked about tips on how to window clean, so I've prepared these two pages explaining our professional methods: Tips on How to Window Clean and How to Clean Small Window Panes. Technology is always looking at improving our lives, and many new advances have been made in the window cleaning industry in recent years. This article discusses a new Robot Window Cleaning machine. If you would like a great, reliable result on the glass, it seems like it's still best to use a professional window cleaner to do the job. Windowwasher.com.au is the website address for El Toro Window & Gutter Cleaning. As for where does 'El Toro' come from?, you'll have to ask the cleaner himself about that!